Preface. Methodology of Work. Types of Forest Formations Throughout the World. Forests of the temperate zone. Forests of the subtropical zone. Tropical forests. Evergreen moist tropical forests. Moist deciduous tropical forests. Dry deciduous tropical forests. Importance of Tropical Forests as a Source of Timber. World timber production. Share of tropical forests in world timber production. Share of tropical forests in world timber export. Structure of Natural Tropical Forests. Republic of Ghana. Basic data. Forests and vegetation formations. Main economic tree species. Forest inventory. Timber processing and export. Republic of Congo. Basic data. Forests and forestry. Results of the forests inventory in the Sibiti-Zanaga region. Forest management in the Sibiti-Zanaga region. Forest inventory and management in the Kouilou region. Production, processing and export of timber. Republic of Gabon. Basic data. The types of forest formations and the categories of forest tree species. Results of forest inventories in the northern regions of the First Forest Zone. Wood processing industries and timber export. Republic of Laos. Basic data. The types of forest formations and main economic tree species. Results of forest inventories in certain localities of Laos. Possibilities of development of forestry and forest industries. 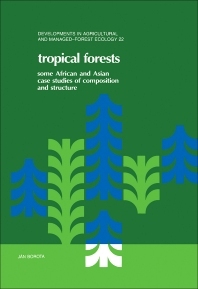 Structure of tropical natural forests in other regions of Africa, Asia and Latin America. Diameter structure of trees in forests of the miombo type in Tanzania. Basic data. Growth possibilities of trees in the miombo type of forests. Structure of Artificially Established Forests in the Tropics. Tectona grandis L. f. Verbenaceae family. Shorea robusta CEARTN. f.. Dipterocarpaceae family. Tree species of the Eucalyptus genus. Myrtaceae family. Eucalyptus globulus LABILL. Eucalyptus regnans F. MUELL. Cedrus deodara LOUDON. Pinaceae family. Juniperus procera HOCHST ex ENDL. Pinaceae family. Pinus caribaea MORELET. Pinaceae family. Pinus patula SCHIEDE et DEPPE in SCHLECHT et CHAM. Thinnings in Pinus patula Stands in Tanzania. Thinning experimental plots in Kiwira Tanzania. Methodology. Analysis of results. Thinning experimental plots in Ngwazi. Methodology. Analysis of results. Comparison of thinning research in Pinus patula in Kiwira and Ngwazi. Conclusions. References. Index of tree species Latin names. Index of tree species trade or vernacular names. This publication deals with the composition and structure of both natural and artificially established tropical forests. After a general introduction, the role of tropical forests in the production of timber is discussed. Attention is then given to the structure of natural tropical forests, especially in Congo, Gabon, Ghana and Laos. The structure of artificially established forests is dealt with in another chapter. At the end, information is given on the thinning of such forest stands in Tanzania.